Now that the festive season is nearly here, Toyota has updated the Innova Crysta, Innova Touring Sport and the Fortuner SUV in India. While you can read about the changes in the new Innova here, the updated Fortuner too gets a host of additions. The 2018 Toyota Fortuner is priced between Rs 27.27 lakh and Rs 32.97 lakh, ex-Delhi. Toyota dealerships across the country have already started accepting bookings for the same and the deliveries are expected to take place shortly. Similar to the Innova update, the Fortuner SUV too gets aesthetic updates without any change in the mechanicals. The 2018 Toyota Fortuner comes equipped with a passenger side power seat, an anti-theft alarm with glass break and ultrasonic sensor, an emergency brake signal, a rear fog lamp and an electrochromatic inside rear view mirror (IRVM). 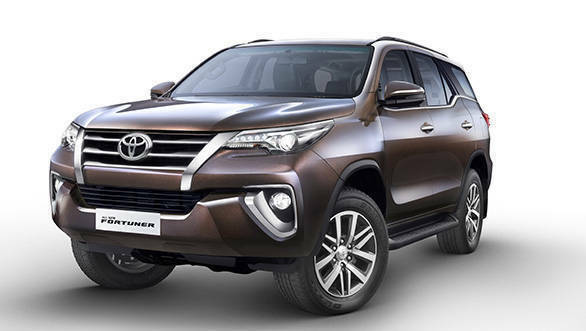 "The Fortuner has emerged as the most popular vehicle, dominating the SUV segment. It is well recognised for its best in class durability, on-road comfort and off-road prowess. The second generation Fortuner received a very positive response for its improved driving dynamics in all terrains coupled with its distinctive, sleek and powerful design," commented N. Raja, Deputy Managing Director, Toyota Kirloskar Motor Pvt. Ltd. He further added, "At Toyota, we believe in 'Customer First' philosophy and in-line with the evolving preferences of our customers, we are happy to introduce the enhanced version with focus on safety, convenience and security features like passenger side power seat, anti-theft alarm with glass break and ultrasonic sensor to cater to the current generation of SUV lovers. The Fortuner has won many hearts in India and globally, since its launch in 2009, the Fortuner has been leading the SUV segment in the country, currently with segment share of over 70 per cent."